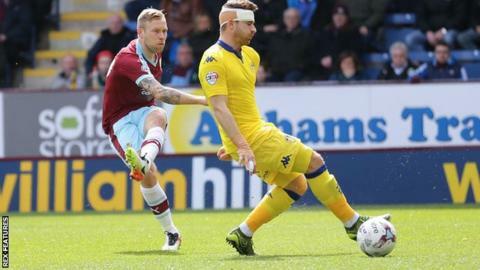 Championship leaders Burnley strengthened their Premier League promotion push with a battling victory over Leeds United at Turf Moor. The Clarets took the lead after just 60 seconds when Scott Arfield found the bottom corner with a low angled shot. Leeds striker Chris Wood headed two glorious chances wide after the break, as Burnley stretched their unbeaten league run to 18 games. Sean Dyche's side are now four points clear of second-placed Middlesbrough. However Boro, who have two games in hand, could reduce the lead back to one point if they beat Preston at the Riverside on Saturday afternoon. Burnley host Middlesbrough on 19 April in what is likely to be a pivotal match in the promotion race as they look for an immediate return to the top flight. Dyche's side, who were frustrated by Cardiff in Tuesday's goalless draw, proved why they are the division's leading scorers with a wonderfully worked team goal straight from kick-off. Top scorer Andre Gray turned provider as he held the ball up beautifully before laying it off to Canada international Arfield, who placed an inch-perfect shot inside the left-hand post from 18 yards. Leeds enjoyed the better of the second half, but Wood could not connect properly with his first header before nodding off target when unmarked in the six-yard box. The Yorkshire club's wastefulness ensured another clean sheet for goalkeeper Tom Heaton as Burnley maintained their unbeaten run in the Championship since Boxing Day. It also extended Burnley's remarkable record of having won 20 of the 22 games in which they have scored first this campaign. Leeds, although not mathematically safe, remain 11 points clear of the relegation zone and look set for another mid to lower-table finish. "If you want to be successful in any industry, but certainly in football, certainly in the Championship, you have to find a way to win. "You can't use the word 'luck' when you're top of the league with 80 points at this stage of the season. "That's not about luck when you've gone this far down the line. It's about all the different challenges and dealing with them over a season. There's still more work to be done." "If Burnley are winning games like today they're destined to be in the Premier League. They're full of good players and have a top manager. "With the two Chris Wood chances, they're bread and butter to him, he would normally put them in the net. His performance all-round, other than that, was very good. "The whole team, we've bossed it with some real quality of passing and movement. The only disappointing thing, and the mystery to all of us, is that we've lost the game." Match ends, Burnley 1, Leeds United 0. Second Half ends, Burnley 1, Leeds United 0. Attempt missed. Ashley Barnes (Burnley) right footed shot from the centre of the box is close, but misses to the left. Assisted by Matthew Taylor following a set piece situation. Corner, Leeds United. Conceded by Michael Keane. Substitution, Burnley. Matthew Taylor replaces Andre Gray. Substitution, Leeds United. Tom Adeyemi replaces Toumani Diagouraga. Attempt missed. Scott Arfield (Burnley) right footed shot from outside the box is high and wide to the right. Delay in match Liam Cooper (Leeds United) because of an injury. Attempt saved. Lewis Cook (Leeds United) right footed shot from outside the box is saved in the top left corner. Assisted by Mirco Antenucci. Corner, Burnley. Conceded by Liam Cooper. Corner, Leeds United. Conceded by Ben Mee. Substitution, Burnley. Ashley Barnes replaces Sam Vokes because of an injury. Attempt missed. Chris Wood (Leeds United) header from the right side of the six yard box is high and wide to the right. Assisted by Charlie Taylor with a cross. Attempt missed. Mirco Antenucci (Leeds United) right footed shot from a difficult angle on the right misses to the right. Assisted by Chris Wood with a headed pass following a set piece situation. Substitution, Leeds United. Mirco Antenucci replaces Mustapha Carayol. Corner, Leeds United. Conceded by Stephen Ward. Corner, Burnley. Conceded by Sol Bamba. Attempt missed. Stuart Dallas (Leeds United) right footed shot from outside the box is too high. Assisted by Lewis Cook.